This is a sponsored post in partnership with Crispy Green and the Produce for Kids' Power Your Lunchbox program. All opinions are my own. Around four years and a half years ago, I was looking for a way to connect with my daughter. She is my oldest and was about to start Kindergarten. I wanted her to remember that whatever came her way, her daddy was thinking about her. I saw some moms making fun bento lunches online and I thought, "Hey, I'm a dad, why can't I do that?" So on Monday every week I have made sure that she knows that I love her with all my heart. This is why when I make lunches like this, it is more than a box filled with fun shapes, it represents why I started doing this in the first place. 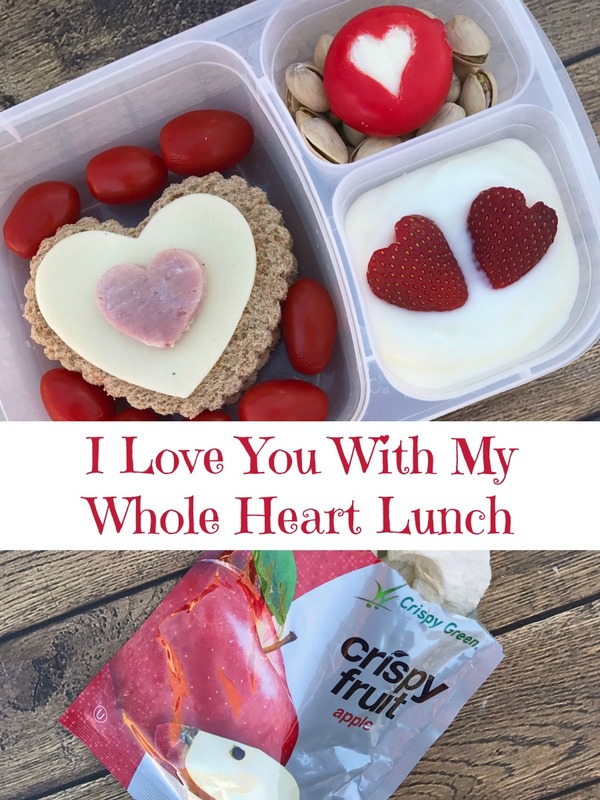 Because these lunches are fun and meaningful, I always want to include food that is both healthy and tasty. In fact, we are consistently trying to introduce new and healthy food to our kids. Lunchtime is a great way to do that. 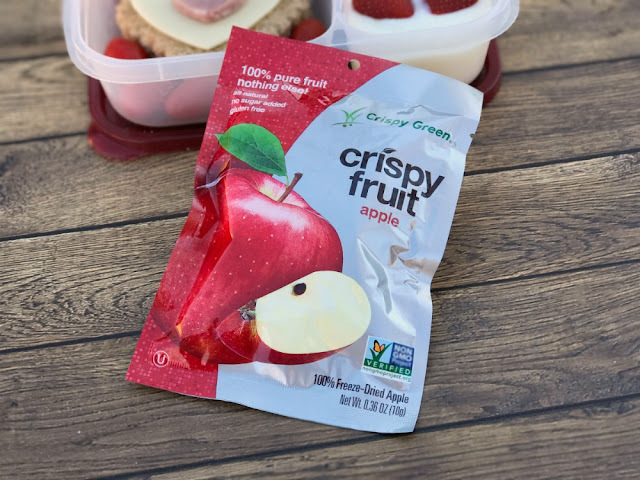 We have been trying out some snacks from Crispy Green, called Crispy Fruit, and my family loves them. 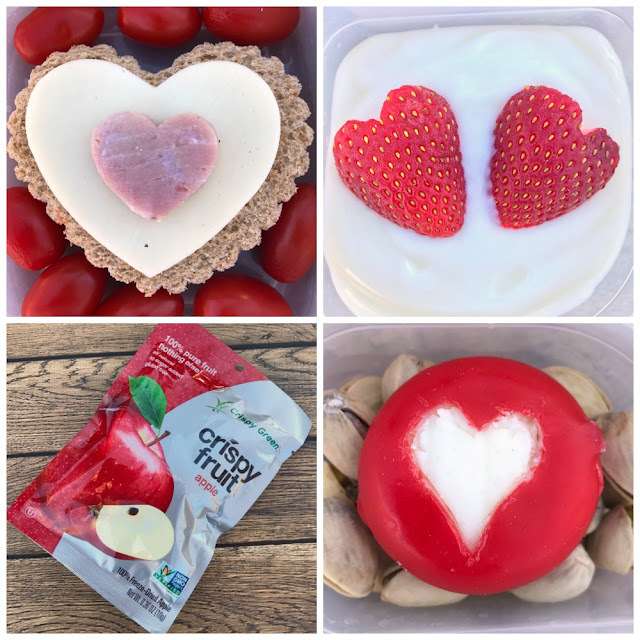 They are freeze dried and 100% pure fruit--no added sugar or preservatives! For this lunch I thought the apple colors matched the theme of the lunch really well. Crispy Green is also one of the sponsors for Power Your Lunchbox Pledge. In August 21,674 families and classrooms pledged to eat a healthier lunchbox, helping to provide 238,414 meals for families in need through Feeding America. This pledge program empowers families with tips, ideas, and recipes to make healthy lunchboxes. When you take the Power Your Lunchbox Pledge to eat a healthier lunch, you can get money saving coupons and money will be donated to Feeding America to provide meals to families in need. To take the pledge and help feed families, go visit the Power Your Lunchbox website now! Ingredients: Crispy Fruit Apples, two whole wheat bread slices, one white cheese slice, one slice of your child's favorite meat, grape tomatoes, pistachios, cheese round in red wax, one strawberry, vanilla yogurt. 1. Cut sandwich bread, white cheese, and meat into three different sized hearts. I used three cookie cutters to make this step a snap! 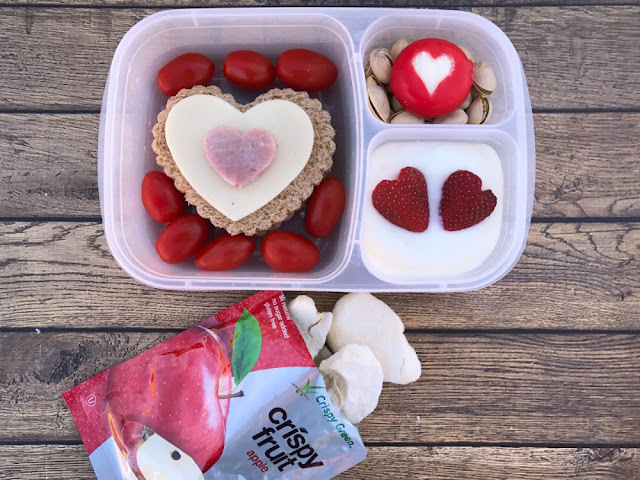 Stack hearts on top of each other to make an open-faced sandwich and then place in main compartment of lunchbox. Surround with grape tomatoes. 2. Drop pistachios into side compartment. Use a knife to cut a heart shape from red wax on cheese round. Place on top of pistachios. 3. Spoon yogurt into side compartment. Slice top off of strawberry. Slice in half longways. Cut triangle piece out of the top of one slice and slightly trim sides to form a heart. Repeat with other half of strawberry. Put both halves on top of yogurt. 4. Make sure and include a whole bag of unopened Crispy Fruit apples. Crispy Fruit is best when it is eaten right away out of the bag so leave it closed until your kid's lunchtime. Have fun showing your kids that they have your whole heart and don't forget to take the Power Your Lunchbox Pledge! To find more fun and healthy food ideas go to www.smartlifebites.com and produceforkids.com. You can also find tips for adults and kids on Crispy Green's Facebook page HERE, on Twitter HERE, and on Instagram HERE. You can find Produce for Kids' Facebook HERE, on Twitter HERE, and on Instagram HERE.